Brett Dragun was among the first wave of initial responders to the Route 91 shooting in Las Vegas on October 1, 2017. Brett loaded an ambulance full of patients and sent them to the hospital. After the initial transport, he took a supervisory role and began collaborating with fire command. Brett assisted with getting transport units to anyone that needed them, and ensured a proper response from AMR. As the night transitioned into morning, Brett did not stop working on the incident. He began checking on crew members and making sure they were holding up alright. Brett also spent time with anyone that wanted to talk about what they had experienced in the days that followed. In his more than eight years of service with AMR, Brett is known as an encourager, mentor, and consummate professional. He has also served on four disaster deployments where he remains the same caring individual. 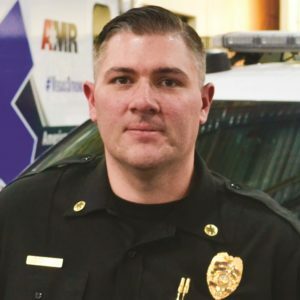 Brett encourages EMTs to further their education, volunteer their time for the disaster response team, or even read to elementary school students. Brett’s peers know that he is someone they can always rely on.